Drive on the road that goes straight from Dilli Haat–across AIIMS flyover–all the way to Qutub Minar and other key heritage sites of touristic interest in Delhi, and the broken-potholed road does not let you believe that in less than two week’s time, Delhi will be hosting the 19th Commonwealth Games. The half-constructed Metro Stations are no less a disappointment. Corruption has already marred the Games spirit and crumbling infrastructure which breaks down as it is being laid down has already kept many from the sporting fraternity as well as tourists away. And now its almost as if the Rain Gods have decided to punish the authorities for the delayed preparations and the reported corruption in the system. Getting the opportunity to host a mega sporting event like the Commonwealth Games is a symbol of pride for any country as it speaks about its development status. Consequently, hosting sporting events is a much sort after opportunity and nations around the world use all that they can to seize it. The Games bring funds for the host country which can well be used for developing infrastructure facilities, both sporting and urban. The Games bring with it a spirit of togetherness, a unique opportunity for the Governments to involve the citizens in hosting tourists. And last but never the least, the Games bring tourists in large numbers, the number being directly proportional to not just how significant is the particular sporting event, but also how attractive the host city/country presents itself. These are but some of the benefits of hosting events like the Commonwealth Games. Unfortunately, not only has Delhi lost out on almost all the benefits of hosting the CWG, the process has now become an embarrassment and a humiliation for the country, internationally. Delayed construction work that caught pace only a few months before the Games (though the authorities had EIGHT years) along with reported corrupt practices has led to an infrastructure that is more a threat than an asset to the city. 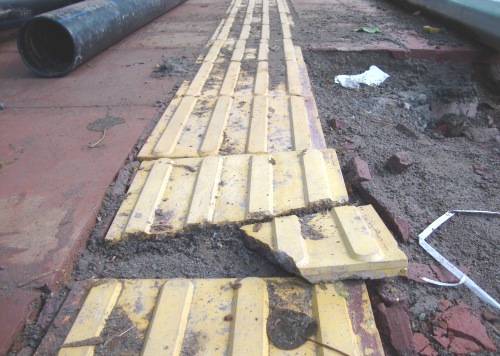 Only today, another incident was reported when a foot-over bridge collapsed, 11 days before the Games. Footpaths uproot themselves shortly after being put in place and more money is spent on repairing them, only to see them uproot yet again. Newly constructed roads have caved in and with most of the infrastructure development projects running behind schedule, it is not just quantity but the quality of work that has been compromised. The delay in the work made the construction go on even during the monsoon season, a time when even the PWD and the MCD who are otherwise famous for their digging-filling in-digging routine leave the roads and its vicinity untouched. It takes no rocket science to understand that dug up pits during the rainy season is an invitation to deadly diseases like dengue and malaria, and many more to follow. Yet the unfinished tasks for the CWG, that should have been completed by May-June, were on in full swing throughout the monsoon. Then came the big shock, the delayed South-west monsoon chose to extend itself. And this again was nothing untold and had already been predicted by the Met Dept. months in advance, to go on till the first week of October. Despite warnings, construction is still on today even as it is pouring everyday in Delhi. And what more could be said when the CWG top brasses are declaring the Games Village, which is also a prominent site of breeding mosquitoes, as “seriously compromised”, “sub-standard”, and unlivable. Why does it always break, shortly after being laid down? The consequence of all this is nothing hidden. Over 2,000 cases of dengue, a disease transmitted by mosquito bite, have been reported from the capital city so far. 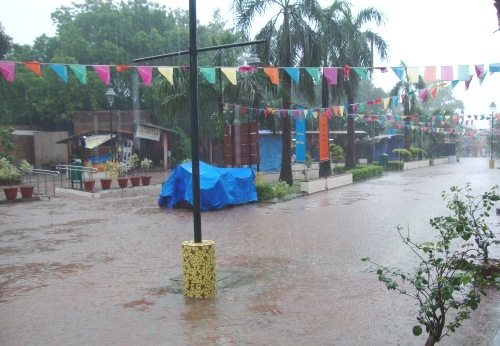 With rains continuing to pour in, the situation in Delhi may only worsen. According to the Ministry of Health & Family Welfare, intense and rigorous vector control measures are being undertaken for tackling the problem. This has brought down the container index (measure of mosquito breeding: No. of container found positive for larval breeding per 100 containers examined) in some areas particularly CWG stadia and games village. But even the Ministry agrees to the gravity of the situation as dengue can’t be controlled without community support and social mobilization. And the authorities lost the latter somewhere in between corruption charges and indifference to public health and safety. All this has led to a crisis which has not only tarnished the image of the majestic Delhi, it has impacted the business benefits from hosting the Commonwealth Games. Sale of tickets for the various sporting events have been on an all time low. There is nothing to rejoice for the hoteliers and those working in the tourism industry as there is no boom in hotel bookings in and around Delhi. And while the events may see some good participation, thanks to the ‘VIP pass’ culture in Delhi, the revenue losses are phenomenal. Major sponsors have also reported to have either pulled out of the event or remained out lest get bad publicity. The authorities themselves launched the publicity campaign only weeks before the Games. The Delhi Tourism website was redone and launched for the Games as late as on Sept. 10, 2010. The CWG song by A.R. Rahman was launched only a month in advance on Aug. 28th, 2010. However it did not really go well with many, even with those in the Government who found it lacking pace and too slow. Many more ‘CWG songs’ have come up since then, even though the Rs. 5 crore song that took six months in the making remains the theme song. Good old pop stars from Delhi like Palash Sen, Daler Mehendi and Shibani Kashyap have all sung and dedicated CWG songs for Delhi. What can now be hoped is that the authorities at least show some last minute leadership and dedication and actually pull off the event, as and when it takes place. And for the few tourists who will turn up for the event, lets hope they are not disappointed, which should not be difficult now, as their expectation level would already be low. National pride, which was at stake, has been damaged and it can only be hoped that those responsible will be charged and punished after the Games, if not right now. Justice cannot wait, but will perhaps understand the need for upholding nationalism in this case. If only those who worked against national pride could understand the consequence of their actions, we Indians could have greeted the CWG guests with even more pride and self respect. NICE POST…CARRY ON DUDE.Visit taldangra.blogspot.com if u wanna c God’s profile on facebook or Gabbar or Thakur’s (sholay) profile on Orkut.